Consumer debt loads and house prices that could be as much as 30 per cent overvalued are the two biggest risks to Canada's economy, the Bank of Canada warned in its semi-annual Financial System Review on Wednesday. The central bank report outlines the bank's thinking on what some of the biggest risks to Canada's economy are. On the whole, the bank says the risks of a major shock to the country's financial system haven't gotten worse in the six months since the bank's last report. But it's still worried about two big issues: household debt, and what it calls "imbalances in the housing market." The bank says it's about 95 per cent sure that house prices have been overvalued by an average of about 10 per cent since 2007. That's based on a new forecasting model the bank says it created, which incorporates existing data from private banks and other government institutions. The model includes data from 40 housing cycles in the past, looking at conditions before and after housing corrections in Canada and abroad. Based on what that model is suggesting, the bank reckons house prices today could be as much as 30 per cent overvalued today. "The large degree of uncertainty inherent in the model suggests a wide range of estimated overvaluation, running from 10 to 30 per cent," the bank said. "It also tells you that we've been overvalued by at least 10 per cent for several years," Bank of Canada governor Stephen Poloz said at press conference after the report came out. "It's not as though we became overvalued yesterday." And a lot of those inflated house prices are coming at a cost of rising debt loads. About 12 per cent of Canadian households are considered to be extremely indebted — which means they have a debt-to-income ratio of at least 250 per cent. That ratio has doubled since 2000, the report notes. The bank's report cautioned that Canada's household debt-to-income ratio is near a record high, conditions that may have been partly fuelled by stiff competition among lenders. Young homeowners, the bank added, have become even more vulnerable to negative shocks to income and to higher interest rates. "Among the current generation of young households, those who own homes carry more mortgage debt relative to income than previous generations did at the same age," the review said. Recent numbers from the Canadian Real Estate Association suggest the average price of a Canadian home hit almost $420,000 last month, up almost seven per cent in the past year. Outside of housing, the bank said the recent decline in oil prices isn't yet at a status where it's a threat to the overall financial system. According to the bank's forecasts, the precipitous decline in the price of oil is expected to knock about a third of a percentage point off of Canada's GDP this year. The impact would be worse, but cheaper energy prices are on the whole a positive development for other aspects of the economy outside of the oil industry. "Lower oil prices are more likely to boost global growth and that's a positive thing," Poloz said. "But that's an offset of some of the negative effects happening in Canada." At least one market watcher found little that was surprising in the report. "The [report] was 'more of the same' in terms of the risks facing the Canadian economy," TD Bank economist Brian DePratto said. 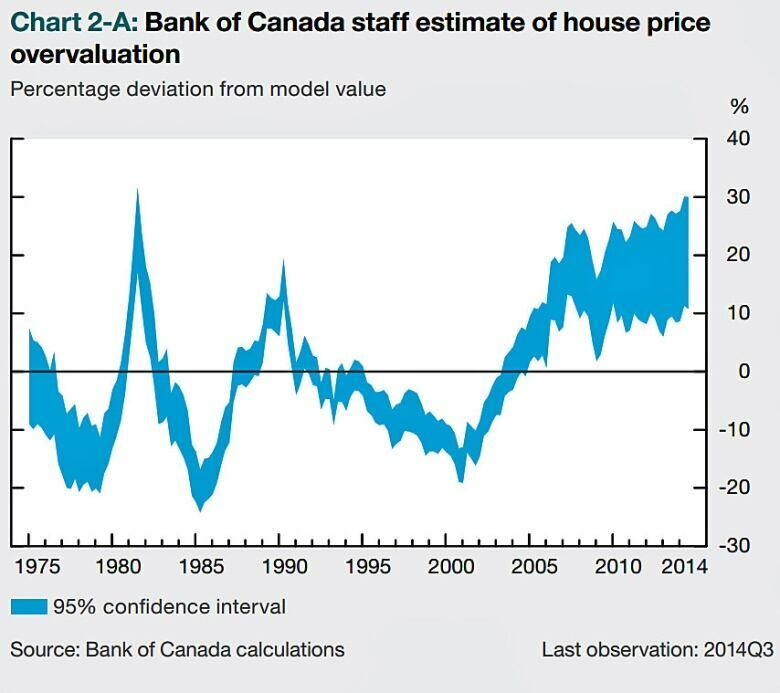 "In line with past reports, the Bank of Canada continues to identify elevated household debt and overvaluation in the housing market as the biggest risks to the financial system."